American watch manufacturers Hamilton have been making ground breaking watches since 1892. Leaders in style and design, this sleek stainless steel bracelet watch is set with a distinctive yet simple black dial. Powered by automatic movement with date function and water resistance up to 30 metres, this Hamilton combines premium function and design. A classic stainless steel bracelet watch from Hamilton. The Khaki King Automatic is a stunning watch for the man in your life. Hamilton men's Khaki King Automatic watch is rated 5.0 out of 5 by 2. 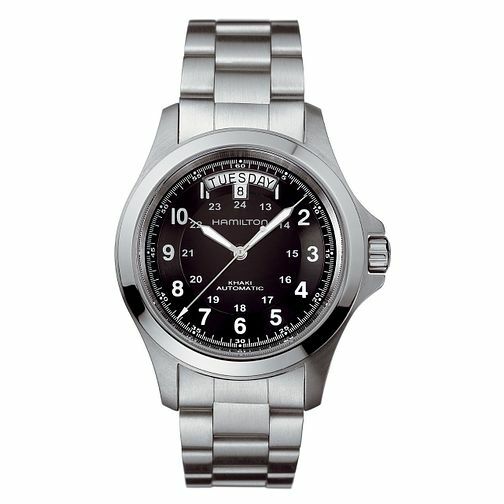 Rated 5 out of 5 by Anonymous from Just fantastic After much research I went for the Hamilton Khaki King, a great watch and very highly respected. Looks great, feels great and is very much a strap monster. Had it on a Nato and a olive green padded fabric type strap and it looks great on all. The movement is great with that Hamilton tweeked ETA giving 80 hours power reserve. When I first saw the watch my gut feeling was wow!!! but like I say after my research before buying it had only gone further up in my loving opinion. Great watch, have no doubt it wont disappoint. Rated 5 out of 5 by Anonymous from Great price & quality Fantastic looking watch at a brilliant price. If your looking for an affordable automatic watch look no further. Hamilton quality design mixed with swiss engineering and build perfect.